3/16" steel sheet with a 55,000 psi minimum yield strength shall be sued to replace the skin plate cut away from the collars. Carefully cut out the roller housing end plate making sure that the roller pin does not get damaged. 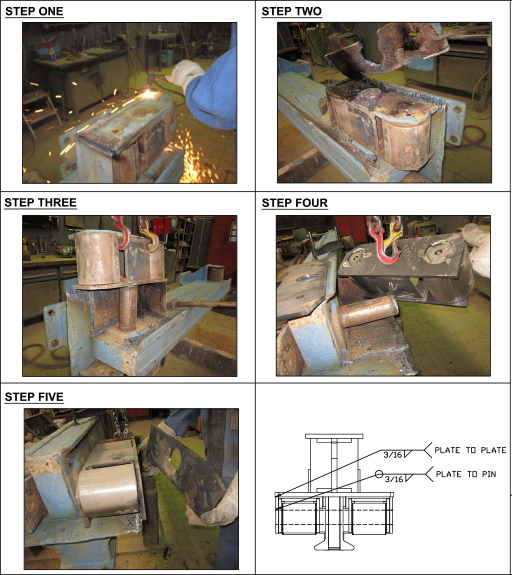 Remove the roller assembly plate to expose the pivoting roller assembly. Prepare surfaces for welding. Weld replacement housing plate to the outside of the housing unit.